Note createTableOnStartup can be true the first time you start your application so it creates the "persistent_logins" table automatically. Below is the schema creation statement for MySQL. You can just run the statement and leave createTableOnStartup=false. Now spring will keep track of the last time the user logs in and will remember the user as long as the token-validity-seconds is not reached. If you are protecting your site against CSRF attacks which you should of course then you will face an additional problem: The user will be remembered but the security token will be invalid. While remember me functionality is very handy in some circumstances it is abused by some developers who ignore the vulnerabilities behind this feature. AS you can see from the above code we are disabling CSRF protection for users opting to be remembered. You might be wondering why you need to use a context file while you don't need it when doing servlet programming. The answer is that Liferay will manage web applications in specific folders below the temp directory. The folders have a portlet number followed by a dash and then the name of the portlet. Under those folders is where you need to touch JSP files in order for the changes to show up. However the number might change so the folder path is not a constant. Definitely the "/Context@docBase" directive comes in really handy. Concurrency problems will not be picked by code reviews, best practices, programming to interfaces, TDD (You could but I am wonder who would be able to afford it), agile project management techniques etc. You must be prepared for your expected traffic and in fact you should write an email to your supervisors making them aware of the software limitation: We currently can handle x concurrent users. Formulas and calculations are OK for estimatives but that is just the theory. Do your hoework and be sure your software will be able to handle the expected traffic. Jakarta JMeter is your free open source friend. I have decided to use Liferay to show an example of a load test. You just need to download Jmeter unzip it and run jmeter from the bin folder, open then the file I pasted below and edit the "Http Request Defaults" to point to your Liferay instance. 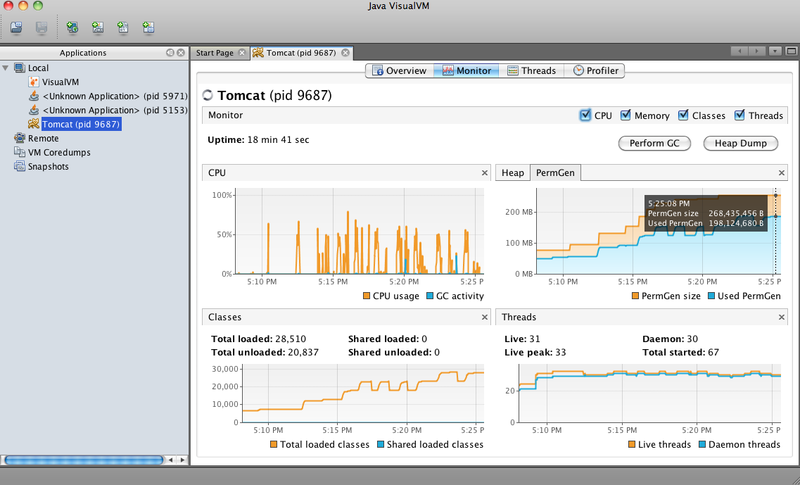 Then verify how your server will handle 100 concurrent users using a ramp up period of 10 seconds. 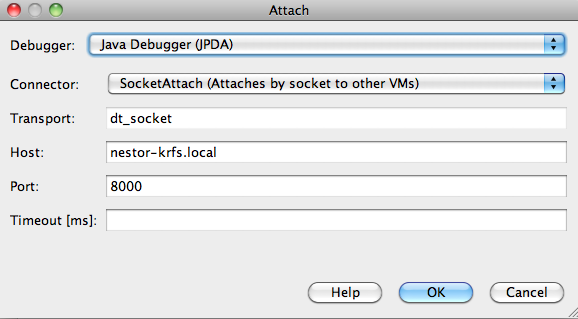 There are a few important things you need to know to keep a Jmeter test growing and usable for your needs. Thread Group: Besides simulating a specific number of users do use a ramp up period that makes sense. Any system even Google can be a victim of denial of service so do test real non-attack case scenarios. This means it is unlikely (if not practically impossible) the 100 users end up hitting your server at the same time. As you see I have distributed the load in 10 seconds. Think about simulating cases where local sample data is affected by several different users. In this case I have added only one user but you can use expressions and build different users on the fly or harcode them in different threads. Analyze the data after running the tests looking for inconsistencies. Run the test first with one user and analyze all responses. There are several views, the "View Results Tree Listener" is your friend to see request and response of each request. Use a "View Results in Table Listener" for a quick inspection about response delays. It helps your identify botlenecks. Use a random timer after each request. My example does not include them but you can easily add it from Menu | Edit | Add. That ensures a closer to reality scenario. A user will not be hitting every second your website. The SDLC is a long circle and testing is an indispensable part of it. Stress tests or load tests are important, way more than what many developers think. Take control and stress the application, don't let the application stress yourself. JSPPortlet can be used to quickly develop a Liferay SDK plugin type portlet or even as I demonstrated before migrate one of the existing native portlets to the more agile plugin environment. My example for the update password portlet was actually still using the original Struts action (UpdatePasswordAction.java). When further customization is needed we face a problem: Parameters sent to one portlet cannot be retrieved from a second portlet. This is simply correct for a JSR-168 specification implementation. You could go around this issue using JSR-286 public render parameters but there is an alternative which in this case is actually cleaner: Use JSPPortlet MVC capabilities to migrate the extension environment struts portlet java code to a plugin environment implementation. So let us change then the portlet to show a results page (view) when the passwordis changed instead of keeping the form (edit). I have used rsync, maven and shell/ant scripts to deploy JSP files into the tomcat exploded application folder but if you are using Eclipse then you cannot miss the filesync plugin. This is simply JSP development/deployment done the right way. On one side you can hot deploy your JSPs to any application server supporting exploded deployment (who doesn't nowadays) and at the same time you just save the file in Eclipse and your changes are pushed into the server. This is perfect for Servlet development, however for Liferay Portlet development for example it won't work as Liferay uses specific folders to store the JSPs with the application server. A similar plugin but running some kind of custom action "on save" could resolve that problem but Liferay has tools of its own nowadays to deal with hot deployment. This is a problem that hits all teams working with Spring and in general Servlet programming. The developer tests locally and even in an integration server with some users hitting the application. Everything looks great but when traffic gets a little bit serious all kind of problems arise. To find out if the program is thread safe you can use smart load tests with Jakarta JMeter but it would be time consuming. It would be ideal if a Unit test could simply make the build fail in case a potential thread safe problem is detected. But the developer must be aware of the fact that every @Service, @Repository and any injected resource must be thread safe. That is the developer responsibility. A simple instance (class) member could result in a total application disaster. 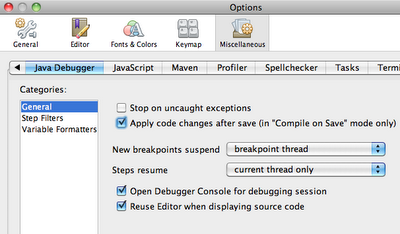 So here is a JUnit test you can use to find out thread safe problems in your Spring code. Just modify it to take into account the exceptions to the rule: If an instance field is needed it should be either thread-safe or it must be declared final and static. I had to increase log level to DEBUG to find out that Spring was swallowing an important SQLException. Commonly you use com.nestorurquiza.web.handler.SimpleMappingExceptionResolver but the exception gets logged with DEBUG level instead. I have to say it again application monitoring should be done from outside and never from inside. Swallowing the exception to rely on things like an SMTP appender and so on break that statement. If email fails and you are dealing with external users most likely the user will complain about a problem you are simply unable to see on your back end. Be aware! HotSwap technology has been there for a while yet I still find many developers not taking advantage of it. In any case the amount of time HotSwap saves can be huge especially if you get smart at debugging (thing that you will do in order to avoid deploy and setup phases). I have used HotSwap now for years in Eclipse. My current team uses Netbeans and I was tempted to just do the same just to realize that was not straightforward at least on version 6.9.1. However not impossible. From Project properties select "build | compile | Compile on Save | For both ... "
From Netbeans preferences select "Miscelaneous | Java Debugger | General | Apply code changes after save"
It is worth to be said JRebel rocks. Not an open source project but not that expensive either. As far as I am concerned I tend to address those parts that cause 90% of the problem first. Following that logic I have found myself spending way more time troubleshooting than actually developing. So definitely if you are performing big changes in your code, you are probably better using junit/selenium for quick initial development in which case the impact of not having the luxury to change/add method signatures, class fields and so on would not be that big after all. But if you are serious about Plain Java Web Development then try JRebel or if you are low on budget and not working on an open source project I definitely recommend (again) DCEVM + HotSwapAagent. 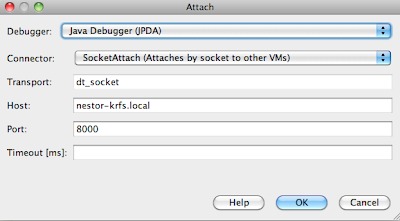 Then from Eclipse or Netbeans I connect to the remote port using JPDA with SocketAttach connector. For Netbeans this is done from "Menu | Debug | Attach Debugger"
Finally for those loving dynamic programming take a look at the cool features from the Da Vinci Machine coming up as part of the JDK 7 release. Inspecting application server logs to act proactively is a must do for developers. In their local environments they should inspect their logs before committing to the VCS. The question is what is happening in other environments, especially in production. How the developer can be promptly notified about an issue. I am not sure if I am just so "lucky" to find so many tech guys proposing monitoring the logs of applications from within the applications. It is simply like saying I am my own Doctor, period. In my opinion log monitoring should be done from the outside. Below are the instructions to get any log and send an email when a line meets certain criteria. Install http://www.logix.cz/michal/devel/smtp-cli/ perl script to send email. I haven't seen so far a most powerful unix sendmail command than this script. Be sure logtail is installed in your system. # @description: Sends an email every time a new PATTERN is found in a growing log file. echo "Usage - $0 logFile  offsetFile includePattern excludePattern from to subject"
echo "If you need no exclusions then simply put some string you know will not be matched"
command="/usr/sbin/logtail -f $logFile -o $offsetFile | egrep -v \"$excludePattern\"  | egrep \"$includePattern\" -A $LINES_AFTER > $TEMP_FILE"
command="/usr/sbin/smtp-cli --host=$SMART_HOST --from $from --to $to --subject \"$hostname: $subject\" --body-plain \"$TEMP_FILE\""
*/5 * * * * /usr/sbin/logMonitor /opt/tomcat-6.0.18/logs/catalina.out /opt/tomcat-6.0.18/catalina.out.offset "SEVERE|ERROR|WARN" "thingsIwantToExclude"  donotreply@sample.com nurquiza@sample.com "catalina.out problems"
I have used JProfiler, Eclipse TPTP, a combination of jconsole and other command line tools in the past to resolve memory leaks problems. 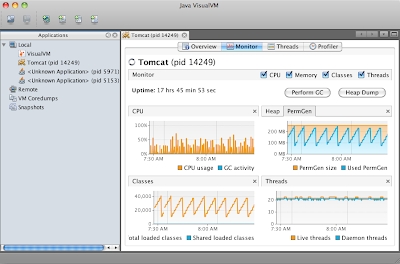 We are using JDK 6 and so Java Visual VM (jvisualvm command) can be used to troubleshoot what is going on. I recall using JBoss as part of one of my assignments and concluding that a total refactoring of the code was needed after finding out memory leaks were most likely there to stay. Regardless the fact that an application server itself might be buggy (and you can just Google about memory leaks for any Java application Server to see that actually all of them have suffered from this in the past) or even the JVM can be buggy there is a lot you can do before just going ahead and blaming others. 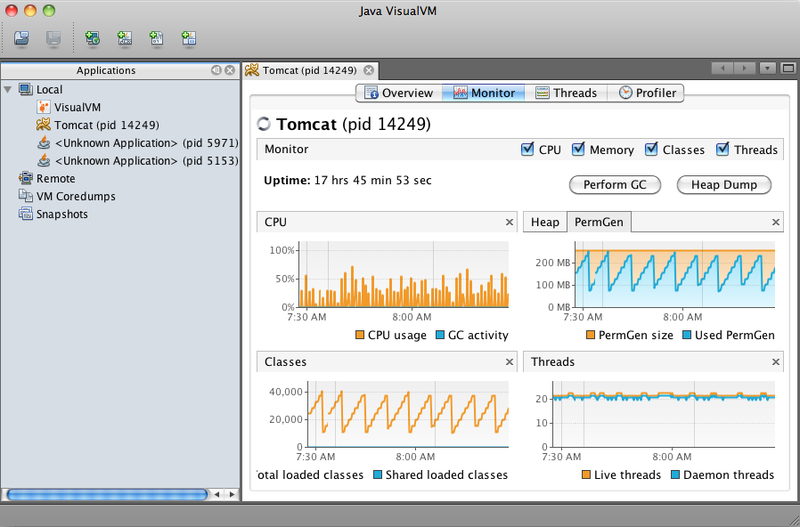 I decided to post the results of a task that involved 10 hours of work plus 12 hours of automated tests to get rid of memory leaks in an application deployed in tomcat. Basically after some deployments the server had to be restarted. SEVERE: The web application [/] registered the JBDC driver [com.mysql.jdbc.Driver] but failed to unregister it when the web application was stopped. To prevent a memory leak, the JDBC Driver has been forcibly unregistered. SEVERE: The web application [/] appears to have started a thread named [Thread-43] but has failed to stop it. This is very likely to create a memory leak. SEVERE: The web application [/] appears to have started a thread named [MultiThreadedHttpConnectionManager cleanup] but has failed to stop it. This is very likely to create a memory leak. SEVERE: The web application [/] created a ThreadLocal with key of type [java.lang.ThreadLocal] (value [java.lang.ThreadLocal@44d2963b]) and a value of type [org.springframework.security.core.context.SecurityContextImpl] (value [org.springframework.security.core.context.SecurityContextImpl@ffffffff: Null authentication]) but failed to remove it when the web application was stopped. This is very likely to create a memory leak. SEVERE: The web application [/] created a ThreadLocal with key of type [net.sf.json.AbstractJSON.CycleSet] (value [net.sf.json.AbstractJSON$CycleSet@5d851ec9]) and a value of type [java.lang.ref.SoftReference] (value [java.lang.ref.SoftReference@4ea84e16]) but failed to remove it when the web application was stopped. This is very likely to create a memory leak. SEVERE: The web application [/] created a ThreadLocal with key of type [org.apache.commons.lang.builder.HashCodeBuilder$1] (value [org.apache.commons.lang.builder.HashCodeBuilder$1@b9eaeb2]) and a value of type [java.util.HashSet] (value []) but failed to remove it when the web application was stopped. This is very likely to create a memory leak. INFO: Illegal access: this web application instance has been stopped already. Could not load org.apache.axis2.context.ConfigurationContext$1. The eventual following stack trace is caused by an error thrown for debugging purposes as well as to attempt to terminate the thread which caused the illegal access, and has no functional impact. Clearly we have a combination of problems here. After I finished all the changes I scripted an atomatic redeployment to occur every minute and I left it running the whole night. Below is a screenshot showing the final situation. As you see PermGen consumption goes up with each deployment (steps in graphic) but it goes down again as a result of Garbage Collection === no memory leak.